We are back with more fall favorites and today they are shared by Jen Wagner. Jen is a member of our creative team and she is responsible for our logos, graphics, hand lettering, website and so much more! We kind of love her. A lot! She makes us look good! Jen also have awesome taste so check out her favorites. There’s something about fall that just stops me in my tracks and forces me to breathe in deep. The busyness of summer is over, the colder weather starts to set in, and nothing sounds better than curling up on the couch with a fuzzy blanket and soup on the stove. 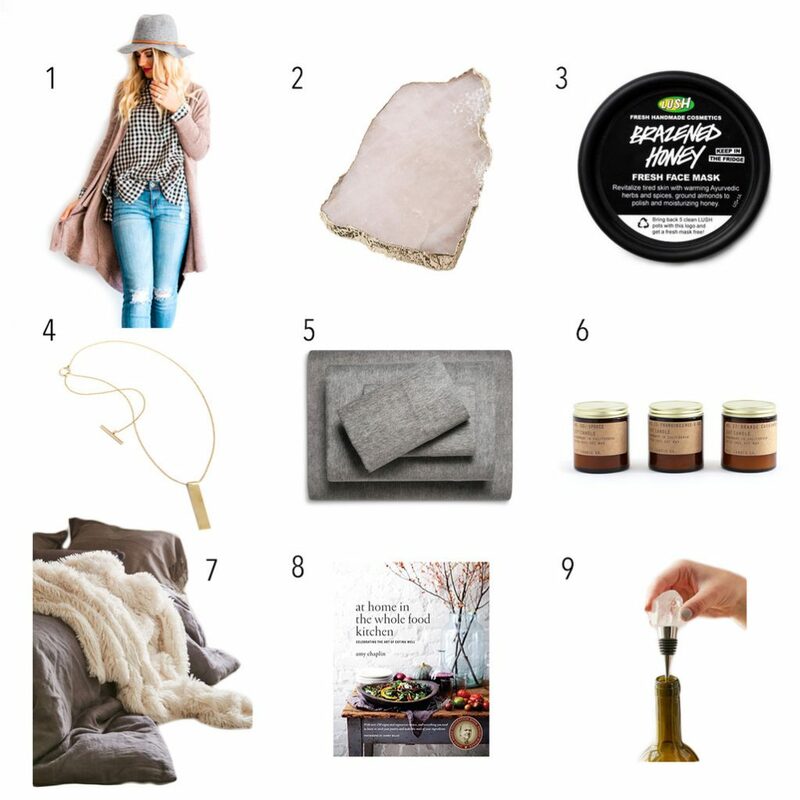 I know fall usually treats me well – here are a few of my fall favorites to make your fall a little cozier! 1. This long cardigan from Brick + Main Co. is the softest cardigan I own and one of my favorite fall pieces. It comes in mocha or emerald and can be warn as pictured or even buttoned to make a cute sweater dress! 2. I swoon over beautiful serving trays, and I use them far more often in the fall. Check out this gorgeous agate cheese tray from Anthropologie! 3. With the weather changing and getting colder and drier, my skin definitely takes a hit. This moisturizing and cleansing mask from Lush is the perfect way to treat your skin – and yourself – this fall! 4. I’m a huge fan of minimalism and love pieces like this necklace when I start layering more in the fall. You can dress it up or down – either way, it’s a great accessory to go with your fall layers! 5. The official ringing in of fall happens when we switch over to flannel sheets. We just got these at Target and love them! 6. Fall means changes happening not only in the weather, but in your scents! These seasonal candles from PF Candle Co. will make your home smell like fall in a heartbeat! 7. Here’s the fuzzy blanket I’m talking about – so cozy! Doesn’t just looking at it make you want hot chocolate and couch time?! 8. With the holidays around the corner, I usually like to be more intentional about eating healthy at home so that it’s easier to handle all the comfort foods at parties. This cookbook is gorgeous and has tons of amazing whole food recipes in it that are perfect for fall, but will still help you fit in those jeans you bought this summer. 9. Fall for us means entertaining, and entertaining means red wine! I love finding beautiful bottle stoppers to keep everything fresh after the friends are gone – here’s a gorgeous crystal stopper from Urban Outfitters. Come back tomorrow for our last fall favorites!